Hello, my name is Harley Davidson Hansen. My story begins when I chose my young master from behind my bars at a shelter a little over a year ago. I refer to him as "my boy". Both he and my mom fell in love with my big chocolate eyes and my goofy personality. My boy named me in honor of his dad who had passed away earlier that year. 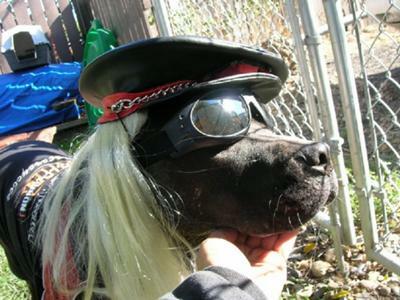 His dad loved dogs and he loved his Harley Davidson, thus my name. I love to go for walks, play with my toys and catch a frisbee. My boy and I had so much fun together. Now, unfortunately my boy has passed away and it is me and mom now. 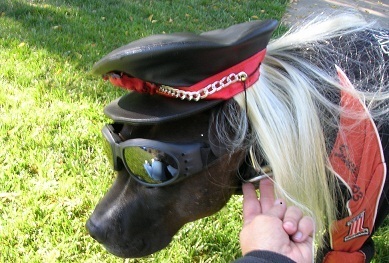 We thought it over and figured it was appropriate for me to be a "biker" dog in honor of my boy as he enjoyed Halloween and I could join in the fun. Why else would I be wearing a wig, glasses and hat? So, until I get to play and ride with my boy that I miss so much . . . I'll have fun remembering the good times and continue to be the "cool dude" that I am. 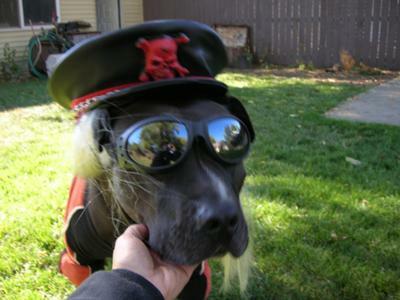 "Treat" me right for Halloween by voting for me, Harley Davidson, the biker dog. P.S. Please let me know who has bones for treats at their house, I'll hit you up! Harley hit up our place, you know we always have treats for you!!! You look awesome!!! Vote 4 my cusin pleez! My mom sez u luk cool in ur blond wig. Hope u win and get lots of kookez! Hey Mr. Harley - I am sure glad we talked your mom out of the pink tutu outfit!!! Hope you get lots of "bonies" on Howl-o-ween! Since we're a little far away, we'll see if the "Great Pumpkin" can arrange to send you some Halloween goodies for trick or treat!!! Have fun with the "new look"--Happy Halloween!! Love the blonde wig thats too funny! Looking good Harley! Love the blond wig!! Hope you get lots of good treats! Harley, you look marvelous! Who'd guess that under that tough exterior is a cuddle dog that "hogs" the bed at night! Harley is such a cool dog. Loves treats, loves his family and friends. He deserves lots of treats even if he does slobber on me a lot!! Super Cool, Harley. Be sure to bury some of those yummy treats for next Spring! If Harley gets to travel, he's welcome to visit for bones with us! Cool as cool can get! What a hot doggie!!!! He looks great and I hope he WINS!!! Harley is a BEAUTIFUL blonde!! The perfect 'look' for such a character. Harley is a BEAUTIFUL blonde!! Gotta love those whiskers!